Well folks, I might have to add this to my weekly food prep routine. Sure, it works great as a sandwich, but it also makes a great snack with some crackers and veggies or just eaten straight-up. It's super easy to make and you, most likely, have the ingredients on hand. I am actually excited for Mondays when I have made this because I know that this will be waiting for me in my lunch bag. I opted for a vegan mayo-less version because I'm picky about condiments...especially when I'm eating something leftover. The dressing is simply made up of tahini, Dijon mustard, lemon juice, herbamare (or salt) and pepper. The celery and apple give the salad some nice crunch while the parsley adds a pop of flavor. The chickpeas are an excellent source of plant-based protein and make the perfect substitute for chicken in this salad. As I mentioned before, this is great as a sandwich on some Ezekiel bread loaded with your favorite veggies for a meal or eaten straight up with a side of veggies for a snack. When I have this in the fridge, I find myself grabbing a spoonful when I walk through the kitchen. 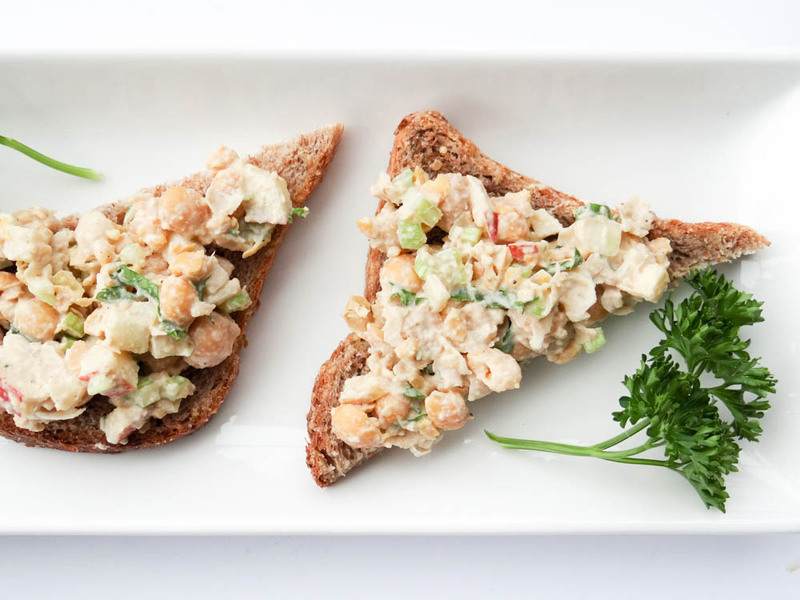 Now that I'm officially on the "chickpea salad bandwagon", I can't wait to give some other flavor varieties a try. 1. In a medium bowl, whisk together the tahini, lemon juice and mustard. Add water or additional lemon juice, 1 teaspoon at a time, to thin to desired consistency. You want it to be thin enough to combine the other ingredients but not runny. 2. Add celery, apple, parlsey, and chickpeas and mix to combine. Using a fork, mash the chickpeas so the mixture is cohesive. Season with herbamare and pepper, to taste.